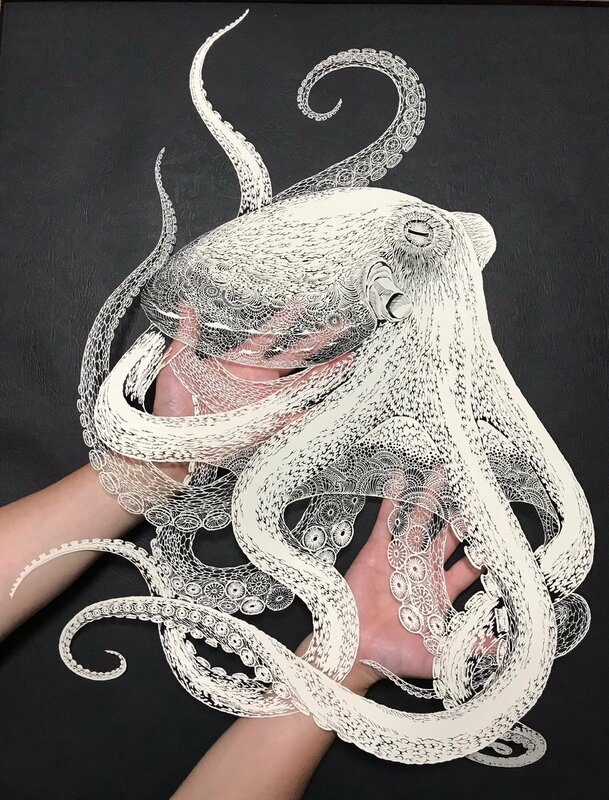 Kirie (切り絵, literally ‘cut picture’) is the Japanese art of paper-cutting. Variations of kirie can be found in cultures around the world but the Japanese version is said to be derived from religious ceremonies and can be traced back to around the AD 700s. In its most conventional form, negative space is cut from a single sheet of white paper and then contrasted against a black background to reveal a rendering. Veteran kirie artist Masayo Fukuda has been practicing the art from for 25 years and recently revealed what she says is her greatest masterpiece of 2018. 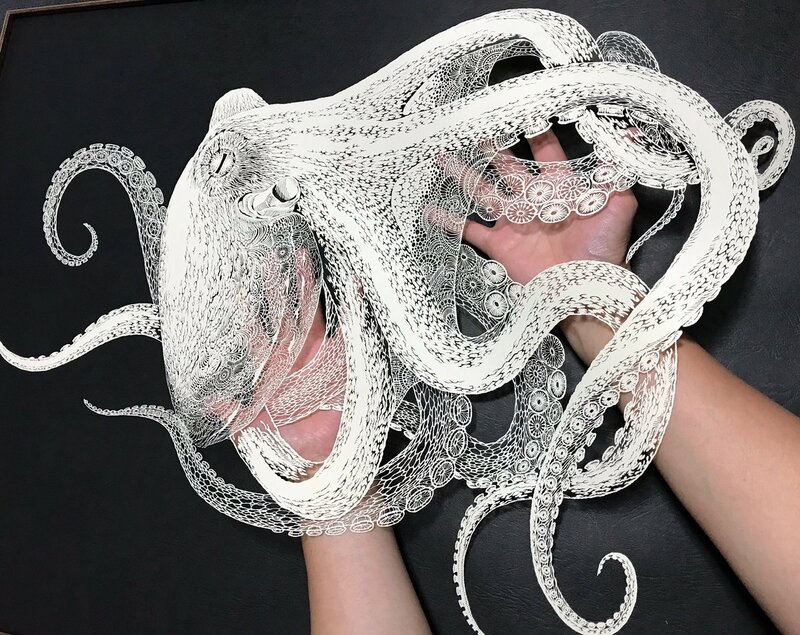 Although the intricate piece looks like several layers overlapped, Fukuda stayed true to the conventional form, using only a single sheet of paper to render her detailed depiction of an octopus. The level of detail at times even looks like a fine ballpoint pen drawing. But a closer look confirms indeed that each and every detail is carefully made from cut-out negative space in the white paper. If you’re interested in Fukuda’s work, she’ll be showcasing her kirie in a joint exhibition planned for next year. She’ll be showing her work along with fellow kirie artist Jun at Miraie Gallery in Osaka from April 24 – April 30, 2019. 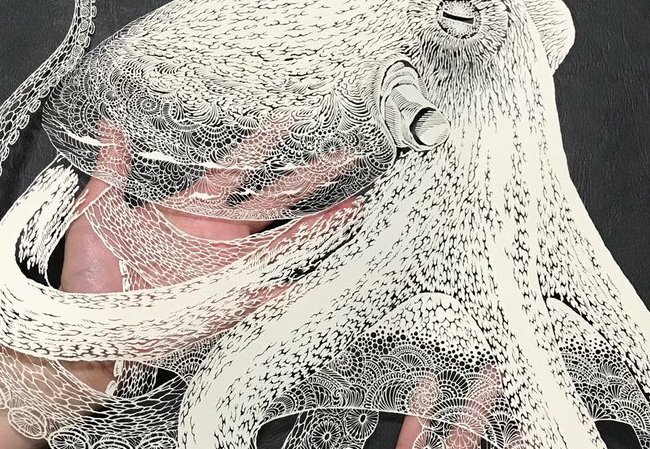 At first glance, the octopus in the video above might appear to be breathing. 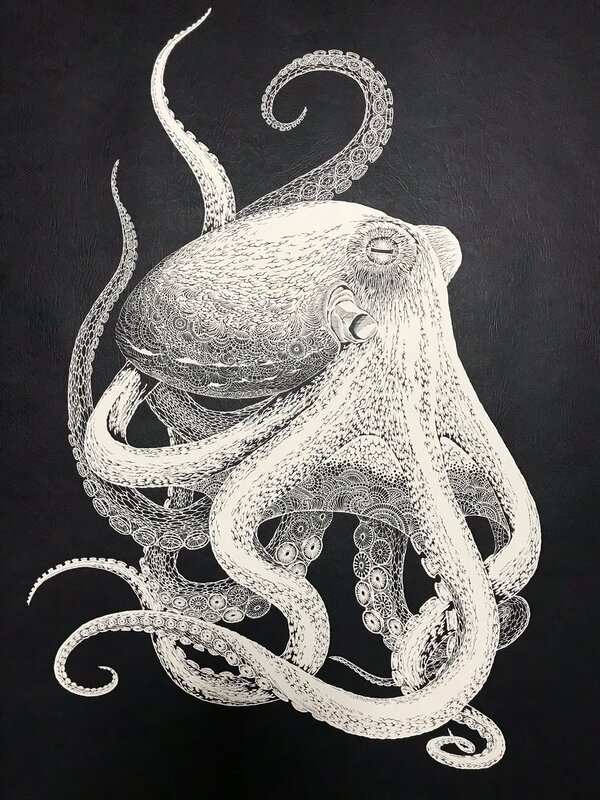 A second look reveals that it isn’t actually breathing, nor is it actually an octopus at all, but seemingly just a highly detailed drawing of one. 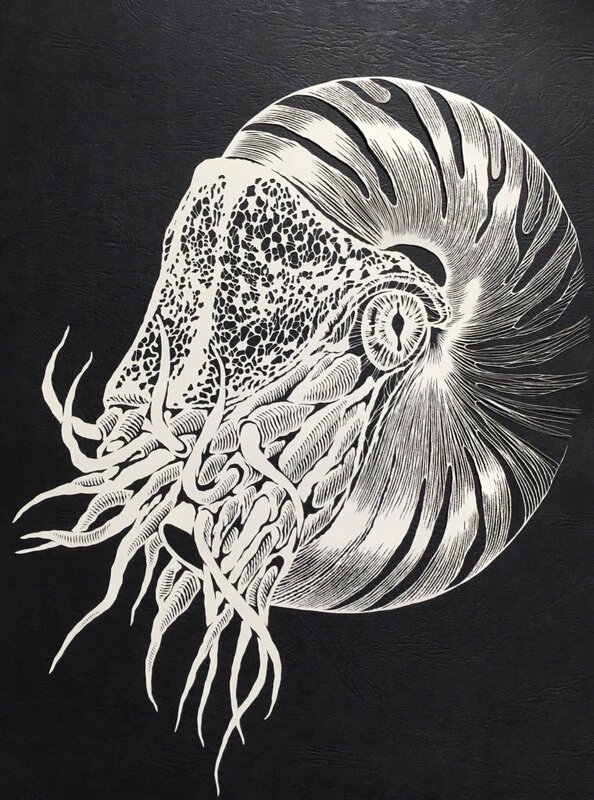 Only upon the third look, if even then, does it become clear that the octopus has been not drawn but intricately cut, and out of a single large sheet of paper at that. The two-dimensional sea creature represents a recent high point in the work of Japanese artist Masayo Fukuda, who has practiced this curious craft, known as kirie, for more than a quarter of a century now. > If you believe being overly busy and overextended is evidence of productivity, then you probably believe that creating space to explore, think, and reflect should be kept to a minimum. Yet these very activities are the antidote to the nonessential busyness that infects so many of us. Rather than trivial diversions, they are critical to distinguishing what is actually a trivial diversion from what is truly essential. However, there is some important information you need to find out before deciding to come here! What I will cover in this article will be related to money. More precisely, the amount of salary paid by companies, taxes and reasons. From a monthly salary of 200,000 yen you get deducted 20 %?! In this article, I will explain thoroughly what and why 20% is deducted and many other important things you should know if you are planning to work here! In fact, the income tax in Japan depends on the annual income. If the salary is less than 1,300,000 yen per year and the monthly income is less than 88,000 yen, income tax is not applied. Then, in the case of more than 1,300,000 yen, how much will be the tax? First of all, let’s take a person whose monthly salary is 200,000 yen a month as an example. For a salary of 200,000 yen a month, the annual income will be 2,4 million yen. In this case, the income tax will be around 56,000 yen per year and if you convert it, the tax deducted every month will be 4,700 yen. Besides taxes is anything else being deducted? The largest amount withdrawn is the for the company`s insurance. The company`s insurance is a social insurance system that includes health insurance, welfare pension insurance, employment insurance, workers compensation insurance etc. Health insurance is a type of coverage that pays for medical/surgical expenses( injury, illness, childbirth, death) incurred by the insured/a person who works for a company. Even if you are not a Japanese citizen, cases when you get sick or suffer an injury may happen, so the state / municipality will bear a part of the expenses(such as treatment expenses). When paying for health insurance, you automatically receive an insurance card that you`ll need to show whenever you go for a health check/hospital. The employees’ pension insurance is a public pension system for the employees. It is a system for people with ages between 20 and 59 years old that provide benefits when retiring; the accumulated amount will be received according to the Old-Age Benefits. There are also unfortunate cases that lead to death (because of illness, disability or injuries) when the family gets the pension of the deceased one. There are disadvantages such as paying insurance for over 10 years in order to receive an employee’s pension and also the current system says you can only get it when you turn 65 years old. So, there are many things to take in consideration when it comes to your future. For those that are freelancers, temporary workers, unemployed people, etc. they will need to join the “National Pension”system and pay themselves. If (A) and (B) below are Regular three-quarter or full time employees, they are insured persons. So, the number of working hours should be over 30 hours and the number of working days per month, more than 15 days. The reason is that the company calculates the employee`s working time reported to 5 days a week /8 hours per day, 40 hours × 3/4 = 30 hours or more, deducting the national holidays/weekends, the monthly working days will be calculated as 20 days × 3/4 = 15 days or more. -The health insurance: in standard remuneration monthly amount × 4.95% (Tokyo metropolitan government`s case), the rate varies in the whole country. -The social insurance from a monthly salary of 200,000 yen(9,900 per day), the contribution amount of the welfare pension will be about 18,300 yen monthly. Employment insurance (insurance) is a system of insurance concerning unemployment / employment continuation etc. based on employment insurance law in Japan. The insurer is the Japanese government. A typical benefit is “job seeker benefit” (so-called unemployment insurance) that can receive for a certain period of time when unemployed. The insurance that the employer must notify the participation to workers who work 20 hours a week. The amount paid is the amount of 5/1000 minutes of face value of salaried money, and if you earn 200,000 yen per month it is about 1000 yen amount. Likewise, if you work within 20 hours a week, you do not need to pay employment insurance, but if you work for more than 20 hours, you need to pay, and it will be a non-refundable insurance. Another tax you`ll have to pay is the inhabitant tax(a tax on income). Same as income tax, there is a tax rate to decide an inhabitant`s tax amount. However, the resident will get it deducted from the previous year`s income and won`t get it withdrawn from his/hers first salary. Residents` taxes vary depending on the prefecture/city you live in; for example,Tokyo’s residence tax is about 9,958 yen. To summarize the above explanation, it is a fact that you can not receive the full salary because a small amount from it will be deducted monthly according to the working hours for that month in order to pay the taxes mandatory for the country. Of course, there are cases when some people have a really low income, therefore the tax they will be paying will also be lower and entering the company`s insurance won`t be mandatory for such situations. However, if the monthly salary is 200,000 yen, the insurance company, employment insurance, resident taxes` all together deducted will result into an amount of 43,858 yen, almost 20% of the salary you are supposed to be getting. Also, as explained earlier, for your first working year in Japan, you won`t be needing to pay the residence tax. So, with 200,000 yen per month, the amount withdrawn, such as company insurance, employment insurance, income tax, etc., will be about 33,900 yen. (That means a few differences in trial calculations). People who work in Japan and those who plan on coming here in the future have to comprehend the circumstances of all these Japanese tax and insurances introduced above, know what what they are paying and have an idea of what to expect or what to ask for when working for a company in Japan. That way, living here will become much easier when you know get a hold of the situation. Also, in case of troubles with your employer, such as unpaid salary, contracts not being respected etc., you can consult with “Tokyo Labor Counseling Information Center”`s labor standards supervision department. We will continue following this topic on our Website, so if there is anything in particular you`d like to know, please leave a comment or contact us on email. I cannot vouch for the accuracy of the above, so don’t take it as actual tax advice. However, in my experience it seems a decent summary of the things one should think about before pulling up stakes. I would have liked this kind of summary before I moved. Please note that I fixed some formatting and English above, but your mileage may still vary.